This is an incredibly decadent and moist cake with an intense chocolate flavor. It is easy to make and will quickly become your go-to chocolate cake recipe. I have baked this cake more times than I can count. It is hands down my most requested cake, and for a good reason. This cake is soft and moist with a rich, intense chocolate flavor. This cake is easy and fast to make and can even be done without an electric mixer which I have done on many occasions. You will want to keep this one in your recipe box for an easy and reliable recipe that will always give you fantastic results. This really is an intense chocolate cake. The secret ingredient for this intense chocolate cake is coffee, yet it does not taste anything like coffee, just chocolate, chocolate, chocolate!! Since coffee has the same flavor elements as chocolate, it deepens and actually compliments the chocolate flavor without making it taste like coffee. Why Should the Coffee be Hot? Adding the hot coffee to the cocoa will melt the cocoa solids and cause the flavor molecules to burst and intensify the chocolate. I mix the hot coffee with the cocoa then let it sit and come to room temperature while I am preparing the rest of the ingredients. This is a simple step that makes a huge impact on the depth and richness of the chocolate. Every time I make this cake someone comments that it is the best chocolate cake they have ever had. The crazy thing about it is that this cake is the easiest cake I have ever made. There is nothing better than an easy recipe that turns out incredibly delectable. I keep the ingredients for this cake on hand at all times just in case I need a quick dessert. The ingredients are simple and inexpensive. If your not a coffee drinker then keep some instant coffee in your pantry, stir a spoonful into some hot water then add it to the cocoa. I guarantee you will get rave reviews for this cake. You don’t have to tell anyone how easy it is to make. Let them think you slaved all day making the most perfect chocolate cake for them! (Because you love them so much). In the video, I used a mixer to blend the ingredients but honestly, the batter comes together perfectly fine with a hand whisk. You don’t even have to worry about over-mixing the batter like most cakes. Seriously, you just can’t mess up this cake. This recipe was adapted from the back of the Hershey’s cocoa box. I have increased the amount of the cocoa to balance out what was otherwise an overly sweet cake. In addition, I switched the hot water for coffee to compliment and enhance the chocolate. The hot liquid is added directly to the cocoa powder to ensure the cocoa solids melt. The result is a perfect and intense chocolate cake. You can use any brand of unsweetened cocoa powder as long as it is not Dutch processed. This cake uses baking soda as a leavening agent which needs an acidic ingredient to achieve proper rise and to balance out the flavors. Believe it or not, chocolate is a naturally acidic ingredient, but Dutch-processed cocoa has been treated to neutralize the acidity and does not react with alkaline leaveners like baking soda. I made four layers out of this cake by cutting each of the layers in half horizontally. This is an easy task to do with the use of a cake leveler but if you don’t have a leveler and don’t feel comfortable slicing the layers by hand, then I have provided instructions to bake the cake in 4 different pans. Just see the notes at the bottom of the recipe card. I made this cake with a super creamy, decadent cream cheese frosting. It’s a great combination that everyone loves. If you want a double dose of chocolate, our double chocolate cream cheese frosting is out of this world! Check out our video and see how easy it is to make this intense chocolate cake with cream cheese frosting. CONNECT WITH SAVOR THE BEST! 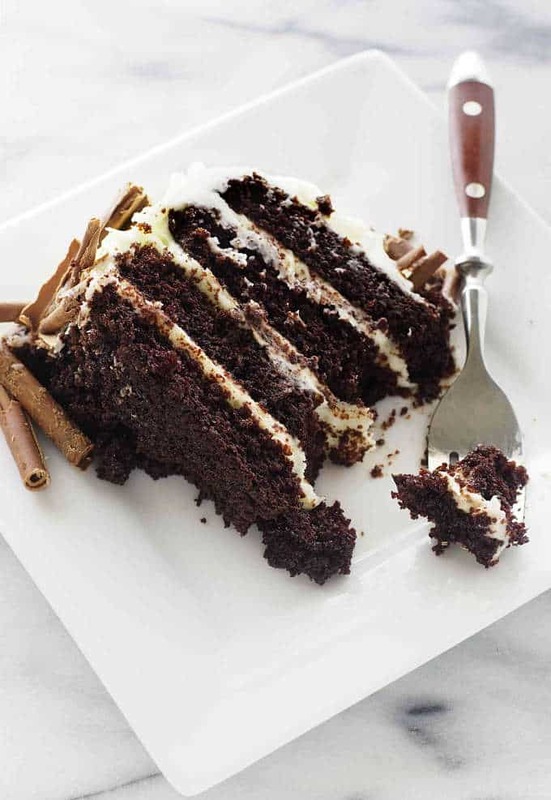 An incredibly moist and intensely chocolate cake with cream cheese frosting. Preheat the oven to 350°. Line the bottom of two 8 or 9-inch cake pans with parchment paper, grease and flour the sides. (The parchment paper will make the cake come out much easier than just grease and flour). If you prefer to bake the cakes in 4 separate pans, see the notes at the bottom. In a medium bowl, whisk the hot coffee and cocoa together until smooth. Set aside. In a large mixing bowl, add the sugar, flour, baking powder, baking soda, and salt. Using a whisk, blend and sift the ingredients together. Add the eggs, milk, oil, vanilla, and the cocoa mixture to the dry ingredients. Mix on low speed for 30 seconds until the dry ingredients are moist. Increase the speed to medium and beat for 1 minute. Scrape down the sides and beat for another minute. The batter will be thin. Pour the batter into the two prepared pans and place in the center of the preheated oven. Bake for 30 to 35 minutes for the 9 inch pans or 33 to 37 minutes for the 8 inch pans (a toothpick inserted in the center of the cakes should come out clean). To make the cream cheese frosting, combine the cream cheese and butter, and beat until soft and creamy. Add the powdered sugar and vanilla beat on low speed until the sugar is mixed in then beat on high speed until smooth, about 2 to 3 minutes. Slice each layer of cake in half horizontally by using a cake leveler or by placing each layer of cake on a turntable and use a serrated knife to slice through the cake as you turn the turntable. This will give you 4 layers to fill and stack. To transfer each layer, use a thin plastic cutting board to slide under the layers. Put a dab of frosting on a cake plate and place a cake layer on top of the plate. Use 3/4 to 1 cup of frosting to spread between each layer of cake then use an off-set spatula or knife to ice the top and sides of the cake. Use natural cocoa not Dutch processed. Here is a tip to make it easier to frost the cake: Partially freeze the cake layers for approximately 20 minutes before frosting. After keeping it in the freezer for a short time, the partially frozen cake will be firmer and easier to frost. This recipe does well with cupcakes. For standard sized cupcakes, bake at 350°F for 22 to 24 minutes. For mini cupcakes, bake at 350° for 10 to 12 minutes. 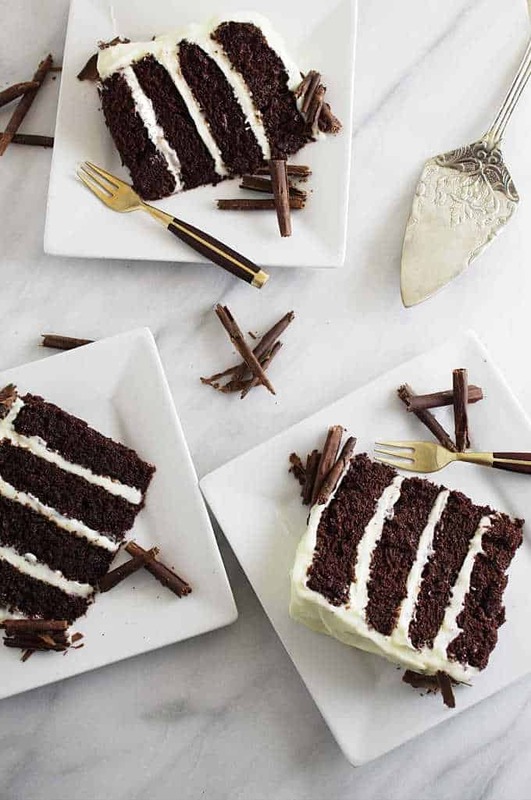 Have you made this Intense Chocolate Cake with Cream Cheese Frosting? We would love to see a picture. Tag us on Instagram. Tania, this is delicious with fresh strawberries between the slices. I haven’t baked strawberries inside the cake but I have put them on and between the layers after it is baked. Is the nutritional information for the whole cake or 1/12th? (Is each 1/12th if a serving 752 calories? Shelby sadly that is the nutritional info for only 1 slice of cake! Seeing the calories in a slice of cake helps me curb my appetite 🙂 The frosting adds quite a bit to the calorie count. Without the cream cheese frosting, one slice of cake is 300 calories and 11 grams of fat. 1 cup of regular brewed coffee (240ml). I imagine an espresso would be closer to 15ml but this is just regular ole brewed coffee. You could also use a serving of instant coffee powder and stir it into a cup of hot water…. either way would work. Thanks for the question. Hey Kim, it seems strange but you’re not the only one that has this problem. If you can’t find natural cocoa powder then use the Dutch cocoa and leave out the baking soda but double the baking powder. So instead of 1 and a half of baking powder, I make it 3teaspoons? 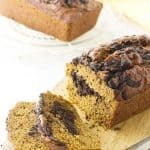 Dutch process cocoa doesn’t affect the quality of the cake(your cake recipe)? Natural cocoa has more acidity and reacts better to the baking soda. If you have Dutch-processed cocoa, there is not enough acidity to let the baking soda react as well. You will get a better, higher rise and a fluffier cake if you use natural cocoa but it turns out pretty decent if you forget and use Dutch process cocoa. Hi! I was wondering if the frosting could be used for a drip cake? Would I have to use more powdered sugar? I want to make it for my mom’s birthday but just add drips to it. Hi Stephanie, yes you can decorate this to be a drip cake. The cream cheese frosting is really soft and doesn’t smooth out as well as buttercream but it can be done. Then just add your chocolate drip. 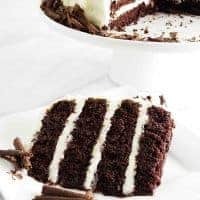 You may want to stick the frosted cake in the freezer for about 15 minutes to firm the cream cheese frosting up a bit before you pour the melted chocolate over it. This is now my go to chocolate cake. I have made it twice now once as a cake and today as cupcakes and they were PERFECT!! The first batch I filled the cups a little full (1/3 cup batter) and baked for 22 min. The second batch I only put 1/4 cup of batter and baked 19 min and they were the most perfect. 😂🤣 They cooled perfectly and did not fall. The tops were almost “crusty” but weren’t which made them easy to frost. AND they came cleanly off the papers whoop whoop win win!!!!! I’m so happy thank you thank you!!! Now I need an equally good buttery yellow cake. OMG This is amazing. I made this for my husband for his birthday. He didn’t used to like chocolate but requested a chocolate cake for his birthday…so I made this… I was so bad I ate two pieces. I will confess I made it in a 9×13 because I do not have room for a tall cake in my fridge but the other will slip in on a shelf. I did have it tall a tiny bit when trying to gauge the time to bake it but very little…It still was amazing. My husband loved it and as you saw above …so did I. This will be my go to chocolate cake…. How many 6 inch pans it will make for moist chocolate cake? it will make about 30 regular size cupcakes and about 80 to 90 mini cupcakes. Check the instructions at the bottom of the recipe for the cupcake bake times. I saw there is three different cupcake size 1oz mini cups, 2oz, and 3oz standard size cups. Does 2oz cups and 3oz cups has same time of baking? No Dana there would be a slight difference in baking time, I haven’t tested the three different size cupcakes but I would just keep a close eye on them and do a toothpick test to determine when they are finished baking. Can I bake it in 6 inch pan as well? What is the oven temperature and how long do I baked it? And how many cups/batter I put in each 6 inch pan? Ken you need to put 1-1/2 to 2 cups of batter in the 6 inch pans and then bake at 350°F. The 6 inch cakes should only need about 22 minutes to bake but do a tooth pick test to make sure they are done. Every oven is a bit different so start checking for doneness at about 20 minutes and adjust the bake time to your oven. Thank you… Do you have recipe for red velvet cake? Ken this recipe is for red velvet cupcakes and can be converted to baked in three 9-inch cake pans for a cake. 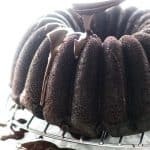 If you are using 6 inch cake pans like this chocolate cake then you will need to put 1-1/2 to 2 cups of batter in the 6-inch pans and bake them for about 20 to 23 minutes. Did you use 1 tablespoon of instant coffee + 1 cup of hot water to your moist cake? Did you use natural cocoa powder to your red velvet cupcakes? Ken you only need to use instant coffee and hot water if you do not have a cup of brewed hot coffee. So either use a cup of brewed coffee or you can use hot water and a scoop of instant coffee. Use natural cocoa in the red velvet cake. What if I have a small oven and only one baking pan(8 or 9inch) can fit the oven, what will happen to other pan that haven’t baked yet? Because I need to wait for the first pan I put in the oven to be cooked for 30-35mins or 33-37mins? Does it affect the quality(don’t rise well, hard, etc…) of the cake if it is not baked for at least 30-35mins or 33-37mins or more? Ken, that works just fine for this recipe. I have had to let some batter sit for 30 or 40 minutes many times and I still get a really nice cake that rises just as well as the batches cakes that did not sit before baking. I would love to hear how your cake turns out. Can I steamed it as well? Hi, Ken….That is an interesting question. We have never steamed this cake. If you don’t have an oven, a toaster oven would bake it nicely. If you decide to try the steaming, please send us feedback we would love to hear back from you. 🙂 Here is a link to Meadow Brown Bakery for steaming a cake. What if I don’t have oven, can I steamed the cake instead? Ken this recipe was not developed for steaming. I have not tried it but I am sure it would not work very well. For good results, you really need an oven. Hi. I just saw this recipe and it sounds yummy. I’m a little confused on part of your directions. Your instructions say to line the bottom of the pan with parchment paper and grease and flour the sides. I have always heard that you are not supposed to grease the sides of a cake pan, otherwise your cake can’t climb up the sides. Is this a miscommunication in the instructions? Or do you really grease and flour the sides of the pan for this cake? Can’t wait to try it. Hey Cathy, great question. It isn’t a typo. I grease and flour the sides of all my cake pans (unless I get lazy). Greasing the sides of the pan will help the cake release easily. And flouring the pan will help give the cake something to hold onto so it will rise higher (it also helps ensure a good release). But to be honest, sometimes I get lazy and skip the flouring part and I see very little to no difference in the height of the cake. It makes a bigger difference with an all-butter cake and very little difference with an oil based cake like this one. I definitely recommend greasing the sides so you can get the cake out of the pan easier. Thanks for asking and I hope you enjoy the cake. Hello! I have a quick question. Can I use coconut oil for the batter? Very good! I made peanut butter icing. They could not stop eating it!! Oh this is so good with peanut butter! I bet I wouldn’t be able to stop eating it either. Thanks for sharing, I love that you used peanut butter icing with this cake. I am so excited to try this recipe out! Looks delicious and not too hard! This cake looks amazing. I want to make a cake with rosettes. Can I use more butter in the cream cheese frosting to make it more pipeable? Or do think it will work fine with this frosting recipie? Martha, yes you can use more butter in this frosting recipe but it is perfectly pipeable without adding more butter. I actually find more butter makes the frosting almost too soft. 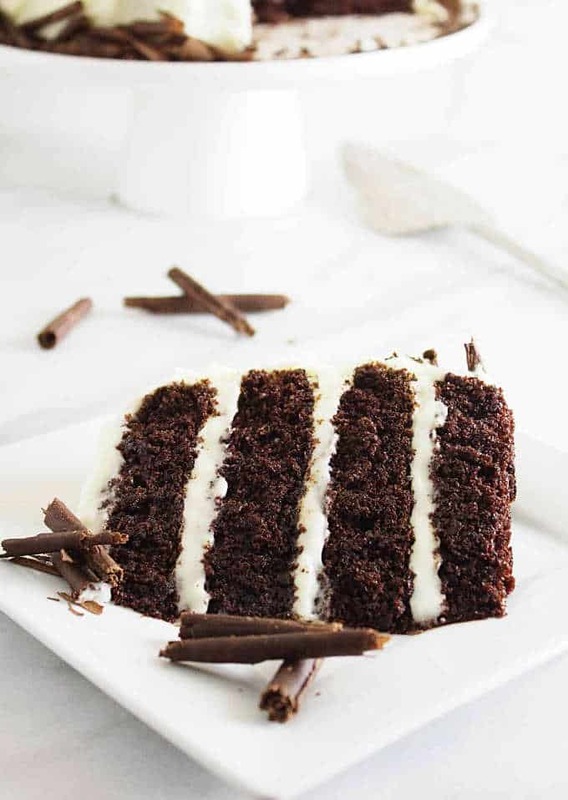 Thanks for sharing this recipe to make a chocolate cake with cheese cream frosting fast and easy. I liked this cake recipe. 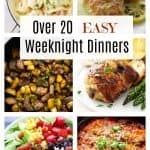 This is perfect for any occasion because it makes fast and easy. I will try it for my brother’s birthday. I only have Dutch processed cocoa powder. Is that ok? Natalie, it should work if you leave out the baking soda and double up on the baking powder. Forgive me if someone else has mentioned this but I used 2- 8” pans and my cakes overflowed all over my oven floor. I should have used 3 pans. Anyone else have this issue? Janelle, I have never had this problem. I wonder how tall your cake pans are? My cake pans are a little over 2 inches tall and I am sure if your pans are not very tall then it will spill over. Make sure to fill the pans 1/2 to 3/4 full and this should not happen. Thanks for your comment. Can this recipe be used for cupcakes also? 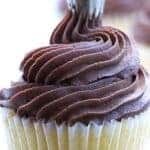 Yes, this recipe does well with cupcakes… bake at 350°F for 22 to 24 minutes for standard size cupcakes and 10 to 12 minutes for mini cupcakes. We agree Tiffanie, it is one of our favorites. Thanks for the comment. water it will probably do the same thing. Thank you, thank you, thank you!!! This was my first cake to make for a group, my dad requested that I make him a chocolate cake with cream cheese frosting for his birthday present. It turned out perfect! That’s great Erin, I’m delighted that it turned out. Happy birthday to your dad!! Can I use cake flour instead and if so what ingrown the will I take out. Yes Denise, you can use cake flour in place of the all- purpose flour but you should add 3 tablespoons (21 grams) MORE of the cake flour. You will not have to make any other adjustments to the recipe. What if I wanted to make it as a,3 layer 9″ round cake, what would think the proper bake time would be? There is enough batter to fill two 9 inch cake pans. You may want to make 1-1/2 batches. Bake time is the same. Hello. I made only the cake recipe and it was a dream! The layers, although extremely moist, held up perfectly. I baked in 4 8 in pans and allowed them to cool overnight. They were very level and I didn’t have to even them out. I filled the cake with a chocolate pudding and iced with chocolate buttercream. I’m making again now with my little sister. Sarah, that sounds super delicious! I’m so glad you enjoyed it. Thank you for sharing your recipe! I made the chocolate cake for a birthday party recently and it was a great sucess. Honestly it is the best chocolate cake I have ever made. Thanks for you feedback Anne, I am so happy to hear that you enjoyed this cake. It definitely is one of my favorites and I always get compliments on it when I make it for people. This looks delicious! I can’t wait to make it for an Oktoberfest party. I bet it would go great with a dark, rich beer. I love the great information you included about using coffee and that cream cheese frosting looks amazing! Yummy! I must try this ASAP! WOW! This looks sooo good!!! My dad, who is a chocoholic would eat this whole thing in one bit!! I may have to make him some! I am not a huge fan of chocolate but your pictures and title itself making my mouthwatering, such a decendent cake! Hi there, I was wondering if I could add some chocolate chips to the batter? you certainly could however the batter is very thin and the chips will sink to the bottom of the pan. I would coat the chips with flour or cocoa powder to help them suspend in the batter better. You might also try adding half of the chocolate chips into the batter then sprinkling the other half of the chips on top of the cakes after they have cooked for 10 or 15 minutes. I made this cake for my dads birthday and I love it. Can I change it into a vanilla cake ? Without the cocoa? I would like one not too big round size cake. My best approach would be to use half of everything? I made this for the 2nd time, almost exactly a year later! Really one of the easiest, best-tasting, impressive cakes I’ve made. Thank you for the recipe! I made this cake for my birthday back in May and it was amazing! Now my daughter is requesting chocolate cupcakes for her 4th birthday this week. I would love to use this recipe if possible. So much better than a box mix which usually come out dry. Any ideas on changes I need to make regarding the temperature (if needed) and estimated time (20-25 minutes?). Going to try it either way, but thought I would check to see if you had already done this. Thanks! I’ve been looking for a cake recipe for days and this one looked like the one. However, Can this cake be made without the coffee? 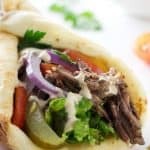 Or do you have a suggested recipe for something similar but without it? I don’t drink coffee for religious purposes. Hi, Allison….Yes, you can absolutely omit the coffee! 🙂 However, be sure to replace the coffee with hot water. Part of what makes the intense coffee flavor is by adding either hot coffee or hot water to the cocoa powder. When the cocoa butter melts it intensifies the chcolate. Coffee is used to enhance the chocolate but this is a deep, dark, rich chocolate cake and it will be delicious even without the coffee. You are going to love this chocolate cake! This is the first chocolate cake I have made that actually came out right and it tasted delicious! It was super moist and had a very deep chocolate flavor. I made it for my friends sweet sixteen and she thought it came from a fancy bakery! Thank you for sharing such an amazing recipe and I will definitely be making it again! I made this cake last week,and let me tell you, this is The Very BEST CHOCOLATE CAKE, I’ve ever made and will be my chocolate cake recipe for now on,the recipe is just as easy as a box cake mix but waaaaay better. Thank you for sharing this, I never comment usually but this recipe is definitely worth writing home about.Now I’m wondering if you have a vanilla, or white cake mix you could share thats easy from scratch like this one. If so PLEASE post it. Thank you for the wonderful recipe.I was definitely impressed. Charmaine, I am so happy you liked it. What a great birthday cake for your dad, I bet it was quite tall if you doubled it and I can imagine it looked incredible. Thanks for your comment and happy birthday to your dad. Rochelle, It will be more stable if you use dowels and a cake board. You can probably get away without using them but I would think that the bottom layers would get squished over time. Also, it will tip easily if you move the cake. I making this cake for tomorrow evening. I am pregnant and not feeling well, so my husband stepped in to help out . I have made a lot of different chocolate cakes, this one was so simple to follow! And it smells so Good! I can’t wait to try it tomorrow! I hope your feeling well enough to enjoy it Mallorie. What a kind and helpful husband you have. It always warms my heart when my husband helps me with things like that. Take care and have a blessed Easter. Dahn – Your cake sounds incredible and I just wondered if the coffee comes across in the flavor at all as I am not a fan of coffee. Hi, Elizabeth, this really is an incredible cake and it is my favorite chocolate cake. The coffee enhances and deepens the chocolate flavor but does absolutely not detectable. Hope you enjoy this cake as much as I do. Thanks for your comments. how much coffee powder should i put in 1cup of hot water?? 1tsp?? 1tblsp?? also can i jst half the recipe and bake it one pan?? How many cupcakes will one recipe make? Hi! 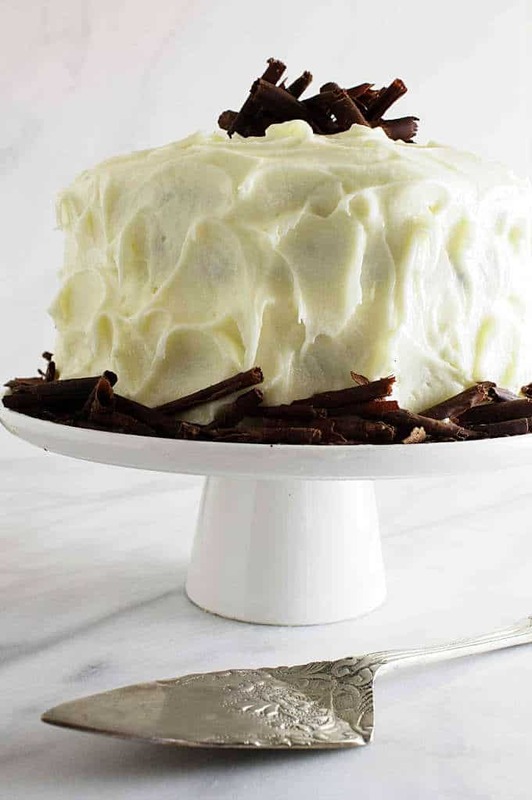 I’m going to bake this cake for my husband’s birthday this weekend and I was wondering if you have any tips on how to ice the cake as it is iced in the photos. I’m not a very experienced baker but I love that it looks like snow drifts and want to try to replicate it! Hi Erin, to get that ‘snow drift’ appearance, first spread the frosting on the cake then take the back of a spoon and press into the frosting then push the spoon down slightly and pull it away from the cake. You will get nice little wavy shapes. It is kind of fun to do so I hope you enjoy playing with the decoration. Robin, I’m so glad you enjoyed it and I agree, it does smell wonderful. You say preheat to 350 degrees…on what should it be baked?? 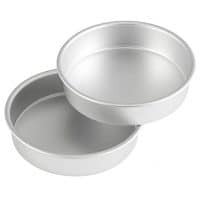 Daleen, you can use either 8 inch or 9 inch cake pans for this recipe, 8 inch cake pans will give you a taller cake as the batter will be thicker. I’m considering baking this cake as a wedding cake. And I was wondering if you could help me with how much batter I will need on every pan. I’ve got one 6 inch, 8 inch and one 10 inch pan. Hi Mette, this makes a great wedding cake and will get rave reviews! To make the wedding cake look proportionally correct you should put 2 cups of batter in your 6 inch pans, 4 cups of batter in your 8 inch pans and 6 cups of batter in your 10 inch pans. I believe 2 1/2 batches should be enough for this but honestly it is easier to just make 3 batches and make cupcakes with the leftover batter. One thing I do with extra batter is make a small 4 inch cake for the bride and groom to freeze and save for their 1 year anniversary. Thank you so much for getting back to me. Hi Mette, I am sorry for the confusion. The weight of cocoa powder will vary significantly by brand. I used the weight for Hershey’s cocoa because I felt like that was the most popular cocoa powder in the U.S… Hershey’s cocoa has a relatively low fat content so that will attribute to the lower weight. I have made this recipe with higher fat brands and always use the weight measurement of 80 grams…. turns out great every time regardless of the brand so I would recommend just sticking with the weight measurement. Thanks for your question. Yes Denise, I think that should be just about right. Half of a recipe is slightly too small for a 6 inch cake but for a slightly smaller pan at 5.5 inches it should be fine. Enjoy! Could you use this recipe (cake & icing) for a 2 tier cake covered in fondant? Yes Tara this cake works well covered in fondant but I prefer to use the frosting as a filling only and then put a thin coat of buttercream on the outside for the fondant to stick to. Moist, very chocolatey, and the cream cheese frosting the perfect complement. This is one I will crave over and over again. Thank you for the delicious recipe! How thick is the batter? I am needing to make a zebra cake and my current chocolate cake recipe is to thin for it. Hi Shisi, you need 1 cup of prepared hot coffee and yes instant coffee works just fine. Mix the coffee granules with 1 cup of hot water and your good to go. So good and so moist! I’ve made it several a times already. Do you think I can make cupcakes out of his recipe? Does it matter what type of coffee you use? I drink a blonde roast, will that still make the chocolate flavor pop or should I pick up some medium or dark? Hi CJ, I’m not really certain, I don’t think I have ever tried a blonde roast. I would guess that if it is a very mild roast it might not impact the flavor quite as much. If you don’t want to change your coffee you might want to try keeping a bit of instant coffee granules on hand for baking purposes. Hi! Thanks for the reply! I don’t mind buying a different kind for the recipe, so which did you use in yours? Hi CJ, I generally buy a French roast or an espresso roast. Can you use brown sugar? I had a recipe that I lost in a fire for a chocolate cake…some of the ingredients…brown sugar, cocoa powder, sour cream & boiling hot water added at the end of the mixing process…was extremely moist…careful not to bake it too long. Cannot remember the correct recipe. Diane, I have not tried this recipe with brown sugar before but I imagine it would work quite well. If you try it please come back and let me know how it turned out. I would love to hear from you. Oh god. I made this cake yesterday and it ended up baking after only 24 minutes. And then the cake fell while baking. And after it had almost a brownie like consistency and the top was flaky. What the hell happened? I’ll tell you. I forgot the damn milk. Ugh. How much batter does this recipe make? How do you think this would work if I used this recipe to make cupcakes? It looks Delicious! does it really take 24 ounces of cream cheese for the frosting? I’m going to the grocery store and just wanted to make sure. I can’t wait to make it! My boyfriend and I found this recipe on Pinterest and made it last minute for a family birthday party and let me say… This cake was PHENOMENAL! It was moist and chocolaty and the cream cheese frosting went perfectly with it! Sooooo good. Since we were in such a rush, we put the cake together while it was still warm, causing the layers to slide a little bit and create a big crack! But no matter, everyone still loved it, thanks so much for the recipe! I am wondering if you could add fruit (Like strawberries or something) to the layers or is this cake not heavy enough to withstand that?? I have added fresh whole raspberries between the layers and it worked very nicely. Keep in mind that the longer fruit sits in a sweetened filing, it will tend to macerate the fruit and the juices will seep out, especially if the fruit is sliced. If you do it, I would recommend serving the cake within a few hours. Enjoy! thank you so much for your reply and advise! Your welcome Trisha, thanks for visiting. can you use buttermilk instead of milk? yes buttermilk works well with this recipe, it is very versatile. Just be sure to use regular cocoa and not Dutch process cocoa. Hi Nicole, any kind of milk works well here, I have used skim milk and whole milk as well as almond milk. Pinning and winning with this recipe! I’ve had an intense week so this is the perfect treat to relax with! This cake looks so delicious, and I’m excited to try it! Do you know approx how many people it would feed? What a beautiful cake! 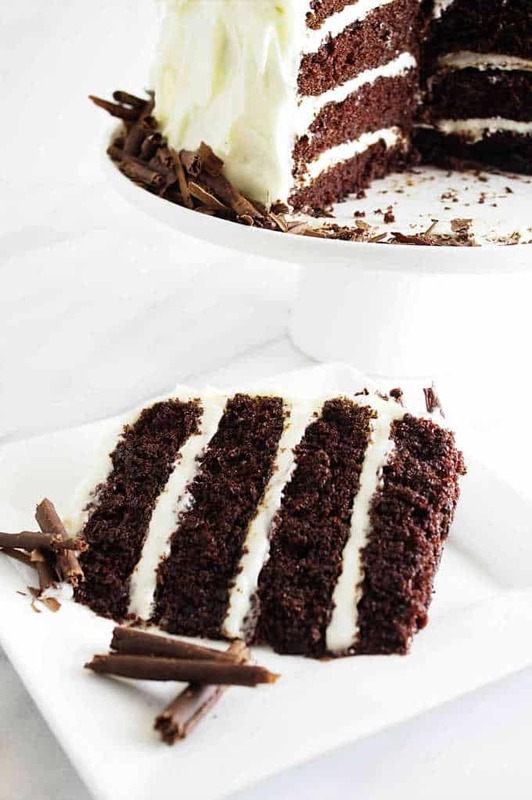 I don’t often see chocolate cake with cream cheese frosting, but I’m sure it’s a delicious combination! So glad you enjoyed this, it is my go to cake as well. This cake looks delicious! Thanks for sharing. Thanks Lucy, it really is! How about a high altitude conversion for us mountain folks? Hi Rebecca, King Arther has a nice page for changes that need to be made for high altitude, click the link for some great information. I have tried google some conversion table but new problem is UK is different from US which is also different from Australia ! henve the confusion ! & when you mention 1 cup of coffee is that 250ml coffee ??? Hi this s seems like a gorgeous cake which I want to try in the coming days but could u kindly concert the 24 ounce cream cheese / 8 tenable spoon ( 1/2 cups ) & half cup vegetable oil in to grams pleassssse ? Your recipe calls for not Dutch processed cocoa. Any particular reason why? Hi Michelle, thanks for asking, this recipe calls for a good amount of baking soda for leavening. Baking soda needs an acidic ingredient for it to properly work and give a good rise to the cake. Cocoa powder is actually acidic and helps the baking soda work as a leavening agent. Dutch processed cocoa powder has been treated to neutralize the acidity so if you use Dutch processed cocoa the cake will not rise as well, it will also have a bit of a metallic taste because the baking soda needs an acidic ingredient to neutralize its metallic-like taste. Thanks! I never new that. I love learning the science in baking. Your welcome Michelle, I hope you enjoy the recipe, it’s definitely a keeper. Needed a last minute cake recipe last night, and this was PHENOMENAL!! 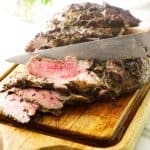 Very easy to put together, extremely moist and tender, and the chocolate flavor was very pronounced. I will definitely be making this again. The only trouble I had was that it was a very “sticky” cake to frost. It could maybe have baked a couple of minutes more (my husband pulled it from the oven while I ran to the store), but it did pass the toothpick test. I think if I had more time I would freeze it before frosting to make it easier (and definitely do a crumb coat). Thank for sharing! Thanks for you comment Becky, I’m so glad you enjoyed it, it is definitely a go-to recipe for me. You are on-point about a crumb coat and freezing, even a quick 10 minutes in the freezer can help firm up the crumb for an easier handle on frosting the cake. 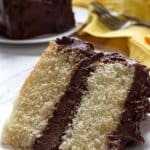 This cake looks like its 4 layers but the recipe only calls for 2 cakes. Can you explain. Thank you! Hi Nancy, yes this cake is only 2- 9 inch layers, I torted the layers (split them horizontally) to get 4 thinner layers, I will clarify that in my instructions, thank you for asking. can I make this cake in a sheet pan? If so what size should I use? I have a quick question, when you say cocoa does that mean sweetened cocoa? Unsweetened? Looks delicious!!! How do I save yjid cake recipe?